How long have you been in the industry? I’ve been working in the hospitality industry for about 10 years, seven of which I’ve spent with Shangri-La Hotel Singapore. Can you tell us more about your role and what you do on a daily basis? I am currently a Senior Events Manager. I handle social events, mostly weddings. I meet up with couples who are thinking of having their wedding celebrations at Shangri-La and walk them through the locations and packages that we offer. Should they decide to confirm their booking, I’ll then put together a team to plan the wedding. We will liaise with wedding vendors, pick out decorations, conduct food tastings and carry out all the necessary preparations for the big day. My role also requires me to work with various departments – housekeeping, kitchen, banquet team, and also the front office. We all have to work together as a team to ensure that the event runs smoothly and seamlessly. After the event, I will meet with my guests to make sure that they were satisfied with how the event went, and to get feedback on what could have been done better. Was there a reason why you wanted to become an events manager? I started off working in Tourism as a travel agent because I enjoyed travelling and I wanted to be part of that industry. After three years, I thought that working in a hotel would allow me to meet different people from around the world, and have unique encounters with every person I meet. With that, I started working in a hotel as a Wedding Coordinator. From there, my passion for events and service grew, and I wanted to do more for my guests. Thankfully, I was promoted to an Events Manager which gave me opportunities to work with more people and make them happy. What do you enjoy most about what you do? I love how different and exciting every day is. No two events are the same, and no two clients are the same. And since I started handling weddings – which are the happiest of occasions – I love how my job allows me to be a part of my guests’ happiness. I generally enjoy planning events that require more set-up and preparation. They’re a little bit more challenging, but when my team and I manage to pull it off well, I get a sense of achievement and fulfilment. I truly enjoy working on weddings. They’re more informal, and there’s just so much to learn as each wedding requires different specifications. So I get to try out different things and grow my knowledge and experience. You handle about 80 to 90 events a year. How do you manage all that? By keeping positive! I stay on top of things by planning ahead for every event. It also helps that I am a very organised person. I meet the clients almost three weeks to a month in advance to finalise their event requirements. I also make sure that I am present during every handover between our client and the operations team. This is to avoid any misunderstanding and reassure the clients that their events will run smoothly. I will follow up with the client at the end of the event to make sure that their expectations were met and that they enjoyed their function. How has your hotel career journey been like so far? It’s definitely been interesting, and I truly enjoy it. The hotel is like my second home. The people here are very warm and helpful – they’re like family to me. What are some challenges you face, and how do you overcome them? Most of the challenges come in the form of guest requests and expectations. For example, someone may request for a six-course dinner to be served in 45 minutes because they want to squeeze in some time for other things like speeches or entertainment. This simply cannot be done, but I will suggest combining some of the dishes so that they can be served at the same time. I’ll also work with the kitchen and banquet teams to ensure that we have sufficient manpower on the event day, so that everything runs smoothly and on time, while making sure to maintain the high quality of food for the event. What has been your most memorable event in your career so far? I don’t think there is a single event that is the most memorable. Every event that I run is memorable to me, because every wedding, birthday, or corporate event is special in its own way. And each event is a different experience, because I get to see how happy my clients are after the event is over. Some of them even became my friends, and continue to work with me to run more events. Besides weddings, you were also previously involved in high-profile events such as the IISS Shangri-la Dialogue for the past five years. How was your experience? Was it different from what you are used to? It was definitely an eye-opening experience. These opportunities don’t come by easily and working alongside big names pushes you beyond your comfort zone. I learnt so much more about my line of work and the different aspects of it. It also brings me great joy when my hard work is recognised. And now, these high-profile clients have used our event spaces more than once and that’s a very big compliment to me and my team. High-profile events require extra special care, especially those that include the government, as they come with a lot of requirements and expectations. It also requires support from every department to ensure a successful event. It is definitely a lot more challenging than a wedding or a celebration but it’s just as fun! Your personal motto is: “I am happy as long as the guest is happy.” How do you think you can make your guests happy with what you do? The most important thing is to be sincere, and do everything from the heart. I also do my best to earn their trust by being truthful, and by looking out for their interests. I also keep up with trends so that I can give my clients the best weddings or social events possible. I look through social media, magazines, and online forums to get ideas. I’ll also compare our prices with others in the market to make sure that our prices are competitive. What motivates you to do your best every day? I get plenty of support from my family, my superiors and my colleagues. I get a lot of help from my colleagues – even those from other departments – so I don’t feel too stressed when I have a lot on my plate. 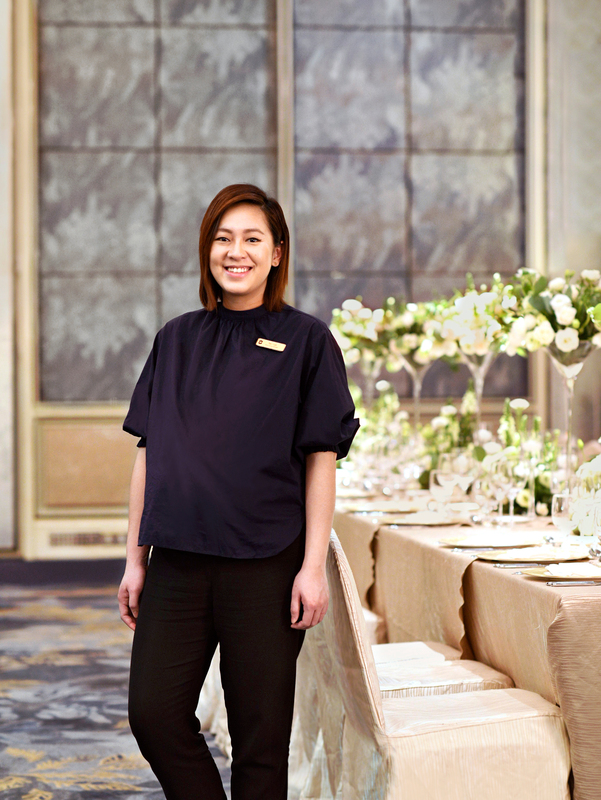 That way, I can focus on making sure that I give my best to all my guests during their events. Have you received any awards while working as an Events Manager? I’ve been awarded the SHA Outstanding Star Award for Excellent Service, as well as a few Best Events Sales Person awards from the hotel. These achievements make me feel like I’m on the right path. And I hope to continue to do better. Do you have any goals that you hope to achieve during your time in the hotel industry? I want to see how far I can go in this career. Right now, my goal is to work towards becoming a Director of Events someday. What advice would you share with someone who is interested in joining the hotel industry? There are not a lot of jobs out there that keeps you motivated to come to work every day, but the hotel industry is always exciting – you can always look forward to something bigger and better. Just remember to be truly passionate and genuine in whatever you do.